Creativity competes for a cash prize at the HighBall Halloween Captain Morgan Public Costume Contests on Friday and Saturday nights. On Friday, dress for the decade for HB: On The Rocks as we celebrate Totally ’90s music and style icons. The best public costume contest in the nation will again grace the stage on Saturday night as HighBallers show off their most creative HighBall Halloween looks to highlight the fabulous fashion of the Battelle Costume Couture Fashion Show. Enter your own handiwork or cheer on your favorites. For two nights in Columbus, creativity rules the night. 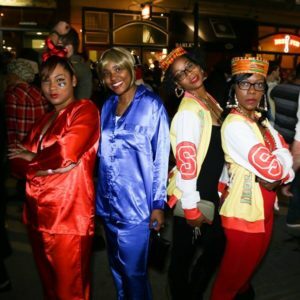 As a bonus, visit HighBall Halloween’s preferred costume partner, Goodwill Columbus, to create your ’90s and High-Fashion looks for this year’s event. Purchase any halloween item from any Goodwill store in Franklin County through October 27 and receive a ticket voucher for half-price admission to HighBall Halloween. From Spice Girls to N*SYNC, Nirvana to TLC, pay tribute to the artists who dominated the airwaves in the ’90s for a chance to win HighBall Halloween’s Most Rockin’ Group Costume. Mariah. Whitney. Celine. Alanis. Aliyah. Celebrate the decade’s greatest solo female artists to take home the prize of Diva of the Decade. Ricky Martin. Busta Rhymes. Will Smith. Usher. Celebrate the decade’s greatest male artists to compete for the title of Dude of the Decade. Friends. Boy Meets World. Fresh Prince. Family Matters. Bring us your best interpretation of the TV characters that have made us laugh, cry, and cringe to vie for Most Tubular TV Icon. Get nostalgic and show us your best 90s looks to compete to be All That And a Bag of Chips. Think lava lamps, Furbies, Beanie Babies, Lisa Frank, and more. From Clueless to Titanic, Pulp Fiction to Jurassic Park, show us your most 90s movie looks to compete for the Most Fly Film Star. Courtney and Kurt. Mulder and Skully. Garth and Wayne. Dress up as your favorite famous pair to win Best Dynamic Duo. Looking like revenge this Halloween season? Show us your wicked or your creepy and make the judges scream in your most terrifying looks to take home the bragging rights of Scariest Costume. From magnificent mermaids to resplendent royalty, show us your most creative Halloween High Fashion look to compete for Best Halloween Fashion. 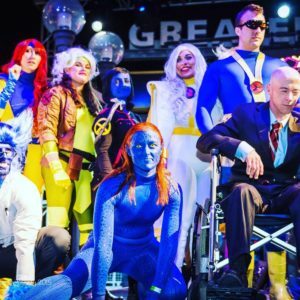 Grab your friends, family, or co-workers and dress to impress for Best Group Costume. Transform yourself into your favorite fictional character from Hogwarts, Gotham or Westeros to vie for Best Cosplay. 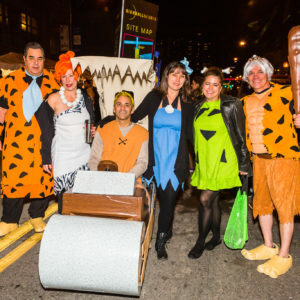 From DaVinci to Andy Warhol, bring your favorite painting or sculpture to life for a chance to win Best Art Adaptation Costume in the Arts District. Is that really a costume? What are you supposed to be? Compete for this year’s Most Humorous/Unexpected Costume. Let the comic strip battle begin this Halloween and dress up as your favorite villain or superhero to compete for Best Comic Costume. From the monsters that haunted our screens years ago to the sinister characters of today, we want to see you pull out all the stops to vie for the title of Best Movie Monster Costume. Whether you were a PBS or Nickelodeon kid, let’s bring out the childhood TV nostalgia this year and compete for Best Childhood TV Character Costume. Tired of two legs, tiny canines, and useless night vision? Drop your humanity at the gates and wow the crowd with your best in winged, furry or slithering splendor to compete for the Best Animal Costume. Out of the Closet Thrift Stores sends the second-place contestant from each category on Saturday to the audience to choose the 2018 HighBaller’s Choice winner. All you need to do to enter is show up! For the Captain Morgan Public Costume Contest on either Friday or Saturday, present yourself to the Costume Contest Coordinators at the Costume Contest tent, located next to the Sierra Mist Second Stage in front of the Hilton Downtown. Contestants will be asked to walk the HighBall Halloween Sierra Mist Second Stage during pre-judging. Our expert Costume Contest Coordinators will conduct preliminary judging of each entrance all night until 9:00PM Friday and until 10:00PM Saturday. Costume Contest Coordinators will determine admission into the contest, as well as placement into a specific category, and will give Costume Contestant wristbands to those who are accepted. Once accepted, you are free to leave the Costume Contest tent and enjoy the HighBall festivities. 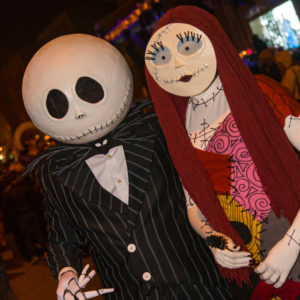 At 9:00PM on Friday and at 10:00PM on Saturday, approved Costume Contestants need to return to the Costume Contest tent to begin lining up for public judging on the HighBall Halloween Schweppes Main Stage. Please note all contestants must fit into one of the defined categories to be in the contest. No more than 10 contestants for each category will be selected to compete. There may be fewer contestants, but no more than 10 for each category. Please review the HighBall Halloween Weapon and Prop Policy here.